As the year 1645 came to a close Englishmen had little cause for celebration. The country was 3 years into a vicious civil war and the populace found themselves under constant pressure from the armies of both sides to supply them with money, clothing and food. 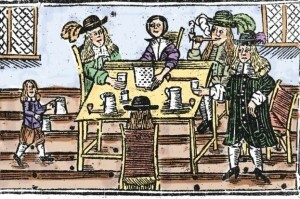 Few Englishmen and women would have thefore been anticipating a particularly merry Christmas even if any of the traditional festivities that they might have looked forward to had not already been abolished by order of the two Houses of Parliament sitting at Westminster earleir in the year – this was Puritan England’s assault on Christmas. A few months earlier, parliament’s New Model Army, led by Sir Thomas Fairfax and Oliver Cromwell, had routed the forces of Charles I at the battle of Naseby. Although that defeat had struck the king’s cause a mortal blow, the royalists still refused to surrender, and so the bloody Civil War was set to continue to rage on. Why did the Parliamentarians ban Christmas Celebrations? So why had the parliamentarians decided to wage war on Christmas – and how did those, like Taylor, who were determined to defend the traditional celebrations, fight back? The attack on the feast of Christmas had deep roots. Long before the Civil War began, many zealous Protestants, or ‘Puritans’, had been troubled both by the boisterous nature of the festivities which took place at Christmas and by the perceived association of those festivities with the old Catholic faith. 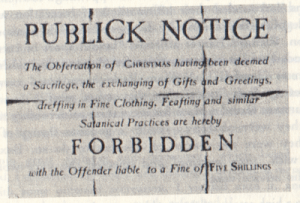 During the early 1600s, most English Puritans had been prepared to tolerate Christmas. Following the rebellion of the Presbyterian Scots against Charles I in 1637, however, all this was to change. as political tensions between Charles I and parliament rose during 1641 so a handful of Puritan extremists took it upon themselves to abandon the celebration of Christmas. The Scottish Kirk, which was itself fiercely Protestant, had abolished Christmas as long ago as the 1560s and, although James I had managed tentatively to restore the feast in his northern kingdom in 1617, it was banned there once again after his son’s defeat by the Scots in 1640. 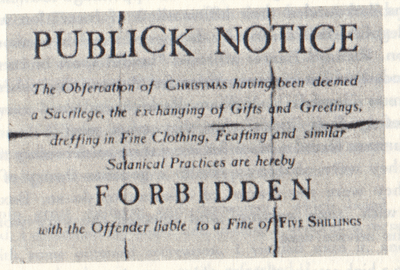 From this time onwards, attitudes towards Christmas among English Puritans began to harden. 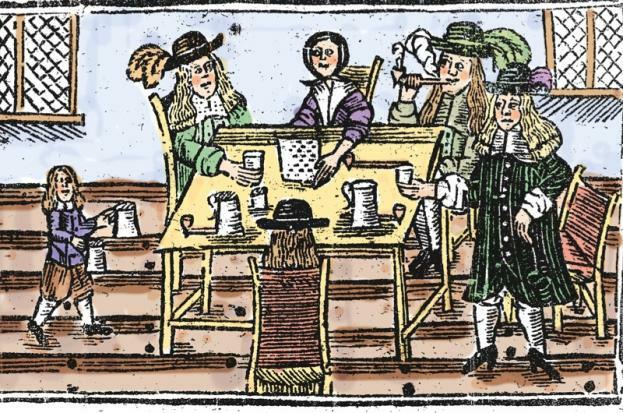 And as political tensions between Charles I and his opponents in parliament rose during 1641 so a handful of Puritan extremists took it upon themselves to abandon the celebration of Christmas. The Protestant leaders of the embattled English parliament, faced with the threat of Irish Catholic troops joining with the Royalist army, requested the aid of the Scots. The Presbyterian Covenanters promised their aid against the ‘papists’, on condition that the Scottish system of church government was adopted in England. This was acceptable to the majority of the English Parliament, as many of them were presbyterians, while others preferred allying with the Scots to losing the Civil War. After some haggling a document called “The Solemn League and Covenant” was drawn up. This was in effect a treaty between the English Parliament and Scotland for the preservation of the reformed religion in Scotland, the reformation of religion in England and Ireland “according to the word of God and the example of the best reformed churches”, and the extirpation of popery and prelacy. In late 1643, desperate to win against the king, Parliament entered into an agreement with Scotland to secure their support called the ‘Solemn League and Covenant’ (see sidebar). One of the clauses of the ‘Solemn League and Covenant’ which parliament signed with the Scots in September 1643 stated that, in exchange for Scottish military assistance against the king, MPs would ensure that further “reformation” of the Church of England took place. This clause effectively encouraged religious radicals on the ground to seize the initiative and to attack those aspects of the traditional ecclesiastical calendar which they disliked. At Christmas, three months after the September ratification of the ‘Solemn League and Covenant’ by parliament, a number of Puritan tradesmen in London opened up their shops for business on 25 December in order to show that they regarded this day as no different from any other, while several London ministers kept their church doors firmly shut. Meanwhile, many MPs turned up to sit in the parliament house, thus making their own disdain for the customary Christmas holiday very clear. During the following year, moreover – when Christmas Day happened to coincide with one of the monthly fast days upon which parliament’s supporters were enjoined to pray for the success of their cause – MPs ordered, not only that the fast day should be “observed” instead of the traditional feast, but also that the fast should be kept “with the more solemn humiliation, because it may call to remembrance our sins, and the sins of our forefathers, who have turned this feast, pretending [to] the memory of Christ, into an extreme forgetfulness of him, by giving liberty to carnal and sensual delights”. In January 1645 the final nail was hammered into Christmas’s coffin, when parliament issued its new Directory for the Public Worship of God – a radical alternative to the established Book of Common Prayer. It made no reference to Christmas at all. 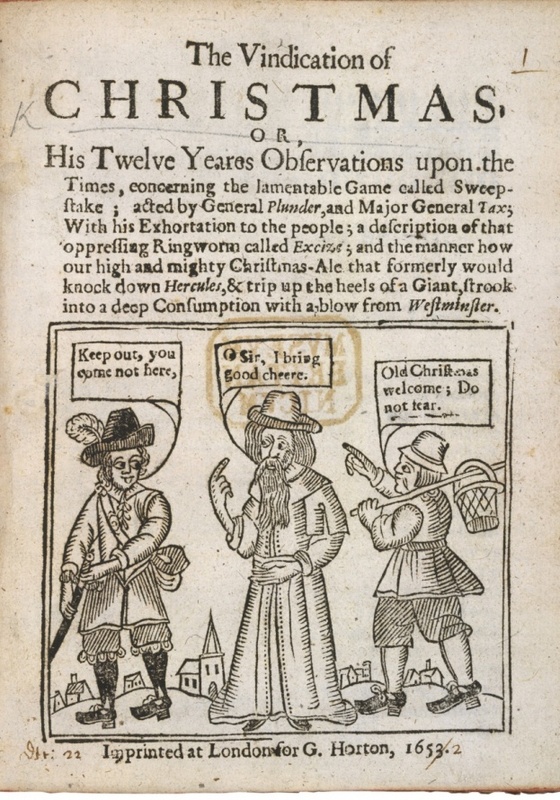 Thus the way was paved for the ‘anti-Christmas’ of 1645. The parliamentarians had abolished the high point of the English ritual year, and effectively cancelled Christmas! 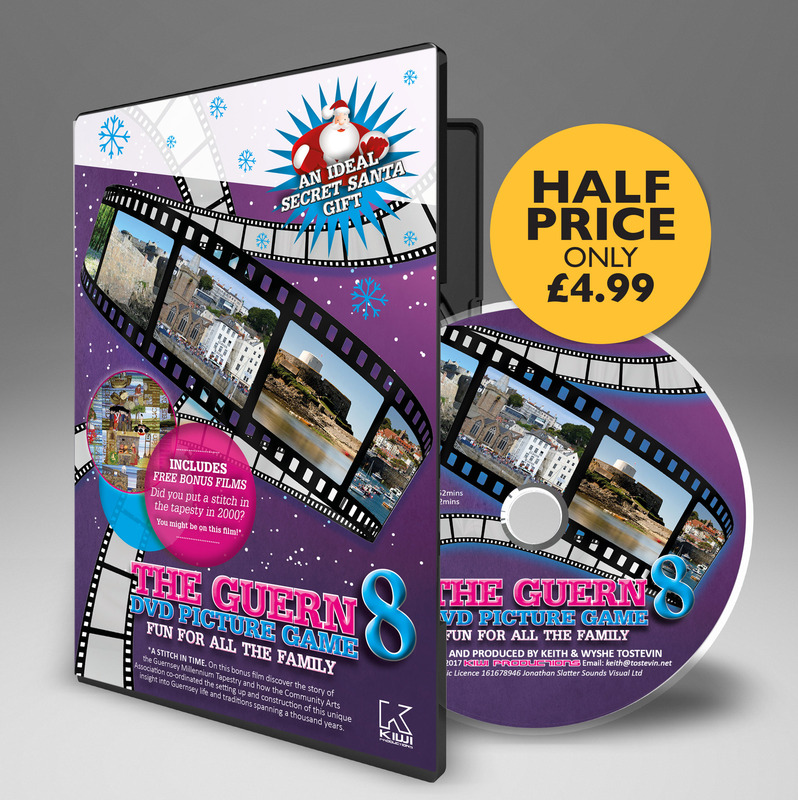 The ‘cancellation’ of Christmas aroused huge popular resentment – not just in the royalist camp, but in the districts controlled by parliament, too. Even before the Directory for the Public Worship of God was pubished a backlash to the pervading Puritan ‘anti-christmas’ sentiment was felt acros sthe country. As early as December 1643, the apprentice boys of London rose up in violent protest against the shop-keepers who had opened on Christmas Day. There were further dark mutterings the next year. On 24 December 1644, the editor of a pro-parliamentarian news-pamphlet expressed his support for the MPs’ decision to favour the monthly fast over the traditional feast, but admitted that “the parliament is cried out on” by the common people as a result, with incredulous shouts of “What, not keep Christmas? Here’s a Reformation indeed!” Many ordinary Londoners continued to show a dogged determination to keep Christmas special during the following year. Yet matters were not so simple, for, even though the king’s armies had been beaten out of the field and he himself had fallen into the hands of his enemies, most Englishmen and women continued to cling to their traditional Christmas customs. So strong was the popular attachment to the old festivities, indeed, that during the postwar period a number of pro-Christmas riots occurred. In December 1646, for example, a group of young men at Bury St Edmunds threatened local tradesmen who had dared to open their shops on Christmas Day, and were only dispersed by the town magistrates after a bloody scuffle. Worse was to follow in 1647 – despite the fact that, on 10 June that year, parliament has passed an ordinance which declared the celebration of Christmas to be a punishable offence. On 25 December 1647, there was further trouble at Bury, while pro-Christmas riots also took place at Norwich and Ipswich. During the course of the Ipswich riot, a protestor named ‘Christmas’ was reported to have been slain – a fatality which could be regarded as richly symbolic, of course, of the way that parliament had ‘killed’ Christmas itself. In London, a crowd of apprentices assembled at Cornhill on Christmas Day, and there “in despite of authority, they set up Holly and Ivy” on the pinnacles of the public water conduit. When the lord mayor despatched some officers “to pull down these gawds,” the apprentices resisted them, forcing the mayor to rush to the scene with a party of soldiers and to break up the demonstration by force. Following parliament’s victory in the Second Civil War and the execution of Charles I in 1649, demonstrations in favour of Christmas became less common. 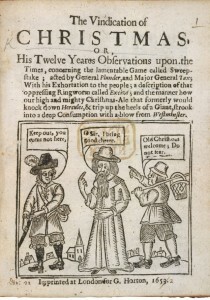 There can be no doubt that many people continued to celebrate Christmas in private, and in his pamphlet The Vindication of Christmas (1652), the tireless John Taylor provided a lively portrait of how, he claimed, the old Christmas festivities were still being kept up by the farmers of Devon. As time went by, Christmas effectively ceased to be celebrated in the great majority of churches. It was ironic, to say the least, that while the godly had failed to suppress the secular Yuletide festivities which had vexed them for so long, they had succeeded in ending the religious observance of Christmas! Following Cromwell’s installation as lord protector in 1653, the celebration of Christmas continued to be proscribed. While he had not been personally responsible for ‘cancelling Christmas’ in the first place, it is evident that both Cromwell and the other senior members of his regime were behind the ban, frequently transacting government business on 25 December as if it were a day just like any other. Only with the restoration of the monarchy in 1660 was ‘old Christmas Day’ finally brought back in from the cold, to widespread popular joy. From that point onwards the celebration of Christmas grew from strength to strengh so that two centuries later, Charles Dickens would be able to be crowned mouthpiece of the ‘true Christmas spirit’ – and that a century and a half later still, the celebration of Christmas would remain as ubiquitous in England and Wales as ever. Thus the defenders of Christmas had weathered the storm.